We've been in our new house for about a week and a half and a lot has changed in that time. I am no longer working outside the home which I can not be more excited and thankful to my husband for making it possible for me to be home with the kids and pursue my passions. I have my studio set up and rather than diving into whats on my sewing to do list I'm going to tip toe a little as to not get overwhelmed. I've really been wanting to bring a simple clean look to The Tangible Artiste and when BurdaStyle offered a webinar on how to draw technicals I signed up, This is my first garment drawing using illustrator and wow I feel like my mind has officially been blown by how much you can do with just a few buttons and a whole lot of patience and determination. Kudos to the graphic designers out there who don't get enough credit for their career! They're probably laughing at my crooked lines but I'm still quite proud! Well on to what matters! 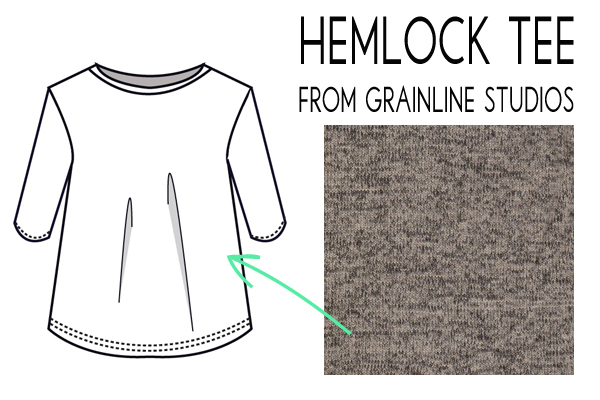 The Hemlock tee was offered by Grainline studios, who is an amazing sewing blogger & pattern designer I love her stuff and I'm looking forward to getting my hands on a few of her patterns, eventually. If you would like to download your own Tee and sew it up grab the pattern. I'll have to do a little altering to it but she walks you through every step in this post. Can't wait to share with you guys and get creative this week!